We are extremely excited to share some wonderful news from Sumatra! And what could be more exciting than a baby elephant! 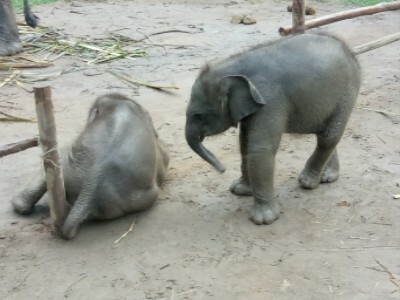 How about TWO baby elephants?! On March 20th, Riksa gave birth to the first baby born at the Tegal Yoso Elephant Response Unit (ERU) in Way Kambas National Park. The female calf weighed in at 190 pounds and is the second calf for 23-year-old Riska. As a special surprise for us, this little girl was named Linda after AES founder and president, Linda Reifschneider. Seven days later, on March 27th, Donna gave birth to a health male calf named Cory. This, not so little, boy weighed in at 270 pounds. And you, our donors, had a part in these miraculous events too! As a direct result of your support, AES was able to donate funds to build an electrical fence enclosure for the elephants to give birth. This gave the mothers more room during labor, but also allowed the mahouts to remain close to assist, if needed. We couldn’t be more proud to have played a role in these wonderful events and we can’t thank you enough for your continued support. Craving more baby elephants? Check out the videos below! New calf in Sumatra gets to know head mahout Nazzarudin while playing in the rain.